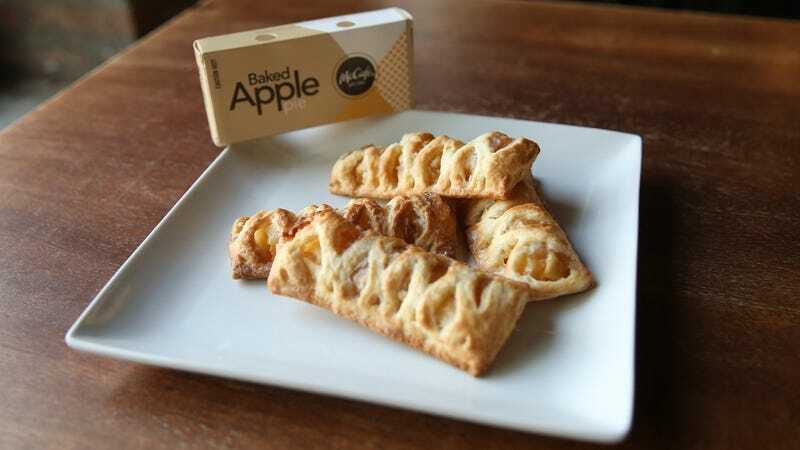 Many of us have had McDonald’s Apple Pie at one point or another. They were a popular item in my family on road trips. I would never have gotten them on a typical Quarter Pounder run, but when we were driving across country, somehow the warm, handheld pie was the perfect snack to make us kids shut up in the back seat of the station wagon. Apparently, a lot of people also have a solid nostalgic feeling for those pies-in-cardboard-sleeves. Because when McDonald’s recently announced it was changing its iconic apple pie, people flooded Twitter with apple-pie-loving pitchforks and torches in protest. According to a press release, McDonald’s states that “our new apple pie is made with fewer ingredients such as sugar, sliced 100-percent American grown apples, and a bit of cinnamon to the filling for flavor to give each one that homemade taste our customers love.” As many complained about the news about the “positive changes” behind this new pie, I decided to check it out for myself (and ask my friends at work to taste it as well, because I obviously love a hivemind). Welp. Hate to say it, but those pitchfork people may be on to something. The manager at the McDonald’s that I went to explained that the old pie was baked and fried, this one is just baked (like it says right there on the box). It has a fancy lattice top and a whole box, not just a sleeve. It still seemed sweet enough, but the crust was dry and chalky without that extra dose of fryer fat. One person equated it to a “piece of bark.” That’s a little harsh, but I get where they’re coming from. The filling, as several people pointed out, lacked the gooey, gelatinous texture of our youth. Nobody could really decide whether that was a good or a bad thing, but this new pie lacks that comforting nostalgia factor. This filling is crunchier, highlighting the variety of apples McDonald’s is crowing about, like Golden Delicious, Jonagold, Rome, Gala, Ida Red, and Fuji. So the fruit had a nice chunky bite to it, not mushy. But the overall effect was a bit underwhelming. Even with the added spice, we felt that the filling could have been a little more cinnamony. 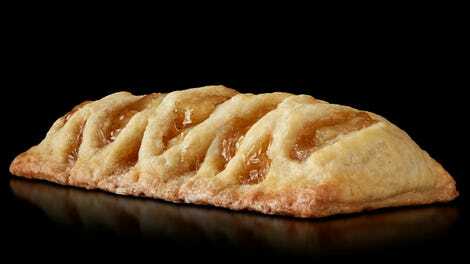 All may not be lost, though: One of my tasters pointed out that the Taco Bell Caramel Apple Empanada still exists, for a “less-fancy” option for fast-food apple pie lovers. Maybe I’ll try one out on my next road trip.